Got more than $2000 a night to spend? This accommodation has been designed with incredible architecture and absolute privacy in mind. You can stay in your typical overwater villa for around $2250 per night or get the ‘honeymoon suite’: a Romantic Pool Residence, which is only accessible by boat and features a sundeck, sunken bath, personal gym, butler and private chef – naturally. You can nab yourself a night there for a cool $9500, depending on season. The hotel’s grape cellar features more than 500 bins, the largest collection in the Maldives – and the hotel’s premier golf academy is exceptional; it’s where PGA professionals provide bespoke lessons to guests. 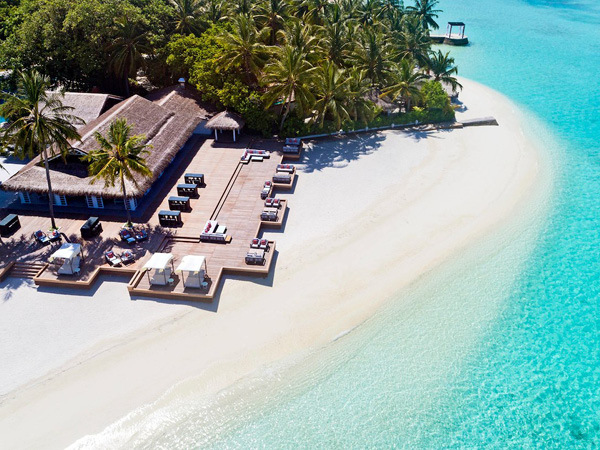 The Sheraton is an incredible option both for special occasions – ideal for honeymooners who dream of celebrating the beginning of married life in an overwater bungalow – and those who are happy to simply lap up the views from the comfort of a beach villa on shore. Water bungalows feature direct access to the crystal clear ocean and depending on season, go for around $943 per room per night. If you’re happy with a beach bungalow however, you’re looking at around $516 per night. The Sheraton Full Moon Resort & Spa is located on a private island just 15-20 minutes from Velana International Airport. It features seven unique restaurants and bars, a spa island – and plenty of watersports. Let’s do something fun and different! 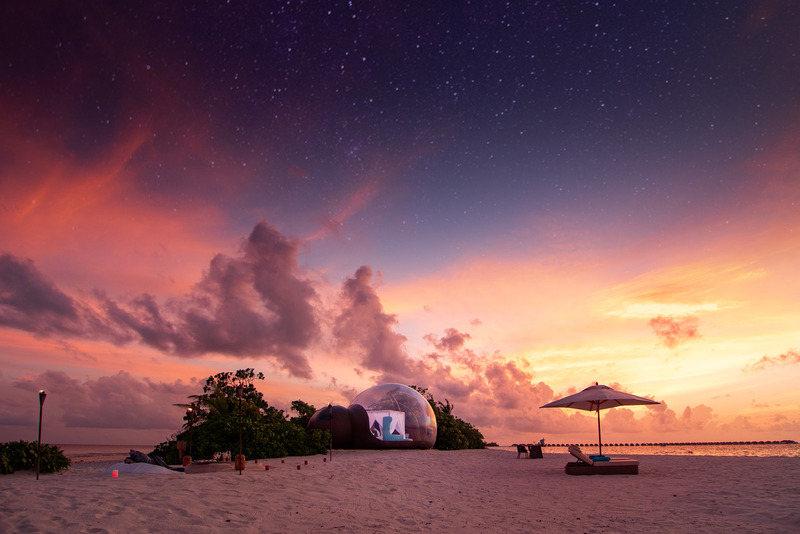 Okay, so it’s not really a week-long solution to your accommodation needs, but the brand new glamping trend from Finolhu – ‘Beach Bubble’ tents – is the first of its kind in the Maldives, and well worth a try. 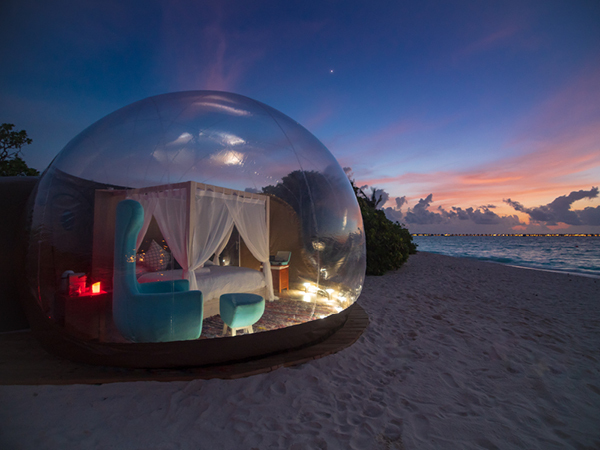 The transparent inflatable bubble allows guests to enjoy a closer-to-nature experience, albeit completely secluded from other guests, but totally on show to the world at the same time. If you’re worried about comfort, you needn’t be – your bubble accommodation is decked out with bespoke furnishings, a separate adjoining bubba bathroom and shower. Made from super-strong, high-tech polyester fabric, your stay will be completely UV protected, waterproof and climate-controlled. Hurrah. For just $830 per couple, you’ll get one night in the beach bubble (7pm to 9am), a private beach barbecue and private waterside breakfast on the beach. Is this Club Med’s most luxurious resort yet?